Each classroom in my kids' elementary school maintains a Wish List of items that the teacher would love to have: pencils, printer ink, printer paper, wipes, that sort of thing. Parents check out the Wish List and buy one or two items so that the teacher and the class can focus on learning. One item that's always on the Wish List is disinfecting wipes. Kids are kids, and they'll always come in after recess and lunch with grubby, sticky hands that they use to pat, handle and touch everything. You can always tell a child to wash his hands in the sink, but you can't wash a desk in the sink! So having wipes in the classroom is key. Most of the time, disinfecting wipes and kids don't really go together -- think of all the chemical residue! 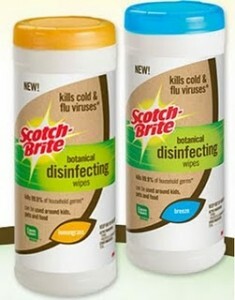 -- but Scotch Brite has come up with a disinfecting wipe that's safe to use around kids, pets, even food. They're called Scotch Brite Botanical disinfecting wipes, and if you're buying disinfecting wipes for your child's classroom, you should check them out. 3M Scotch-Brite™ is introducing “no-rinse” Botanical Disinfecting Wipes that kill 99.9% of household germs*, kill cold & flu viruses and leave school surfaces – such as desks, tables and chairs – residue-free. Surprisingly, most disinfecting wipes that are used in homes or schools (on any non-porous surface) require rinsing after wiping. The “no-rinse” feature found in the Scotch-Brite™ Botanical Disinfecting Wipes provide a safe and effective way to make sure your kids are able to clean and breathe easy while at home, daycare or school. * This product uses CleanWell, a thyme-based formula that's safe for kids and kills germs naturally. I know and love CleanWell hand sanitizers and disinfectants, and I use them all the time on my kids, so I feel good about using these wipes around my kids. * It doesn't smell harsh or acidic or chemical-ly (is that a word? you know what I mean). The Lemongrass scent is really mild and pleasant, and quite possibly the best-smelling wipes I've ever smelled. * You don't have to rinse the surface off after wiping. In the interests of being more eco-friendly, I'd love to see a Scotch Brite Botanical disinfecting spray, that can be used with a washable cloth. Scotch-Brite Botanical disinfecting wipes are a must-have in every classroom! Leave a comment on this post and share a tip for keeping your child healthy and germ-free in school. This entry must be completed before any extra entries will count. 3) Follow Bonggamom Finds on Networked Blogs (1 entry). Disclosure: I did not receive a sample or monetary compensation for this post. I received a product sample to facilitate my review, but have not been paid to review the product or give my opinions. Product information is provided by the featured company/product and is indicated in italics. The views and opinions expressed here are my own. ALWAYS WASH YOUR HANDS! And, I keep a disinfectant spray in the kitchen and bathrooms. teach the kids to when they wash their hands to scrub for at least 15 seconds.. or long enough to sing Happy Birthday. I encourage frequent handwashing and try not to send my daughter to school sick. I'm a facebook fan of Bonggamom Finds under username Jennie Tilson. Left comment/link. My son and I both try to wash our hands as soon as we come home from school and work. We stay healthy and germ free with lots of disinfectant including wipes, hand sanitizer, and hand-washing :) *Thanks* for the giveaway! Hand washing is a very big part of keeping my son healthy and germ-free. His teacher has them wash their hands often and as soon as he gets home he washes again. Other than that we take vitamens. Wash hands a lot! Take extra vitamin C when school starts. hand washing is the best habit a child could have when heading back to school. I don't think there's a whole lot you can do once your kids are at school. I like to give them a multivitamin, as well as extra vitamin C. But I also like to keep all of our door knobs, cupboard handles, and remote controls wiped down with disinfecting wipes, in hopes that I stop germs from coming in the house! I suggest cleaning and sanitizing door knobs. Congrats to the winner: #1, GoldenOrchard!